Red Dead Redemption II has a lot going for it: beautiful story, brutal and gripping combat, fascinating realistic mechanics. Oh, and a bunch of cheat codes. You remember those right? It was before the days of being charged money for "EXP boosts" in games. Anyway, Red Dead Redemption II has a lot of them! Some of them still haven't been unlocked, but here's all of them for now and how you input them. Go to settings. Look in the bottom right corner. You'll see the button you need to press to access the cheats menu (Triangle or Y depending on your platform). Press it. You'll come to a screen filled with locked codes. You need to input certain phrases to unlock them. Keep in mind, after you use a cheat, saving becomes disabled as do achievements/trophies. Here are the phrases you need to enter and their corresponding cheats. Become instantly drunk: "A fool on command"
Increase wanted level: "You want punishment"
Decrease wanted level: "You want freedom"
Own all outfits: "Vanity. All is vanity"
Create a wagon: "Keep your dreams simple"
Reset your honor: "Balance. 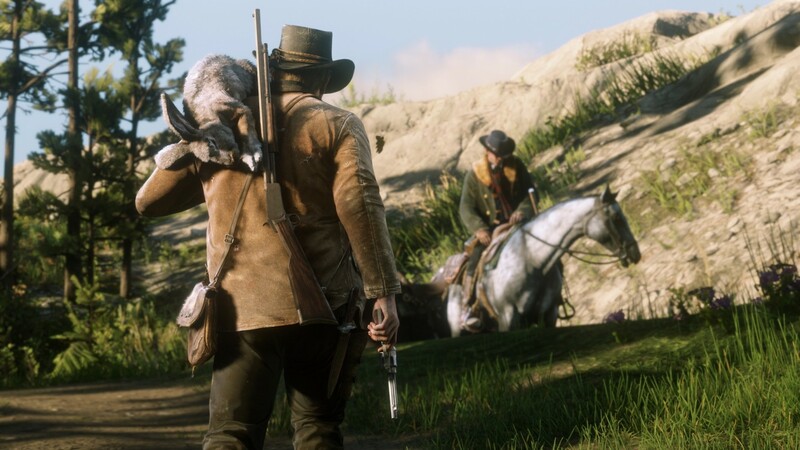 All is balance"
Get stealthy weapons: "Death is silence"
Dead Eye Level 2 : "Make me better"
Dead Eye Level 3: "I shall be better"
Dead Eye Level 4: "I still seek more"
Dead Eye Level 5: "I seek and I find"
Increase horse whistle range: "Better than my dog"
Obtain standard weapons: "A simple life, a beautiful death"
Create a horse race: "Run!Run!Run!" Increase horse bond: "My kingdom is a horse"
Health + Stamina + Dead Eye are full: "You flourish before you die"
Get $500: "Greed is now a virtue"
Learn all recipes: "Eat of knowledge"
When further codes are discovered, we'll update our list. For more on Red Dead Redemption II, check out our glowing review.